A pre-k teacher at school turned me on to these great books about a little boy who causes lots of trouble. No, David! 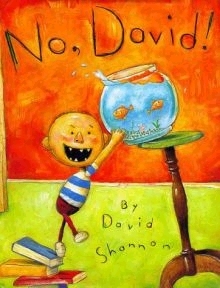 This Caldecott Honor book shows the mischievous David constantly being told “No!” by his mother. He gets into all kinds of big trouble, but in the end he knows his mother still loves him—even when he’s punished. This is a great story for pointing out all the mischief little kids can cause and still remind them adults love them no matter what they do.